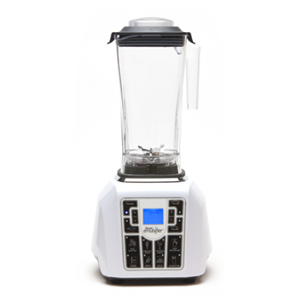 The Shred Emulsifier is a blender which emulsify food with its powerful 2HP motor which keeps all the fibre, vitamins and phyto-nutrients intact making meals very nutritious. The Shred is endorsed by Dr. Ian Smith who is a Harvard graduate, a NY Times bestseller and tv celebrity featured on The Doctors, Rachel Ray Show and Oprah. The machine features 8 pre-programmed buttons for simple one-touch controls allowing you to make smoothies, soups, purees, nut butter, frozen drinks, frozen treats, hot beverages and flour. It contains a quick start and recipe book which contains healthy meal ideas that claims it can help you lose weight, feel my energize and live a healthier life. With your help we can reach more people and let them know about Shred Emulsifier by Dr. Ian Smith whether this product works or not. I bought the blender and it worked really great, however it doesn't last. Within a year, it started to make a funny noise and now black smoke comes out when I turn it on. After 10 months of service it is dead as a door nail. I received it as a birthday present and when I looked to the warranty is limited and only for 60 days. if it works it is good, however, it does not last. I decided to try the shred emulsifier because of Dr. Ian and the 100 year warranty. The vita-mix is to expensive. I too am surprised of the 1 star ratings. This blender thoroughly liquefies the frozen fruits and variety of greens that I use in the 10-day green smoothie detox program. I have to press the smoothie tab 2-4 times since it is set at 30 seconds, however, that is not an issue with me since I have seen the vita-mix blending for several minutes on the QVC channel. I am very pleased and impressed with this blender! I ordered it making sure I would be billed in three payments of $33.33. Instead of billing me $33.33 I was charged the whole amount of $119.98. Being 73 yrs old and on a low income tight budget, I cannot afford the whole amount which is why I ordered the 3 monthly payments. I spoke to customer service which was very very rude and dismissive. I tried contacting Dr. Ian Smith I've not recieved a response. It arrived yesterday and I am sending it back today. Dr Ian Smith should check into products he is endorsing and for being known for such bad customer service,. I ordered it in July of 2014, it is August haven't received it, yet they charged me in one payment, should have been three, then they charged me for another payment, so instead of $149, I paid $149 + 50, no one can help me. They told me I didn't get charged, arguing with me. I tried getting in contact with Dr. Ian Smith on Facebook, so far nothing. Why should anyone buy it, when there is no one to stand behind the product and the problems consumers are having with their idiot customer service center. I called, wrote, still nothing, not it is August 9th, 2014, still have not received it was charged, no chargebacks yet, had to get the bank involved. Horrible, horrible, horrible! Now, I am writing to the Attorney General, in hopes someone can help me. I had to cancel my debit card, so I am without a card for about one week now, my checking account is messed up, as they were supposed to only charge me 49.99, and charged me over 200 dollars, so two payments were returned from my bills I paid, causing me $35 from each creditor for returned payment, plus a $50 charge for overdraft, add that to what I paid, almost $300 for something I still have not received. Buyer beware stay away from this company.